Product #20640 | SKU 4017C-R | 0.0 (no ratings yet) Thanks for your rating! The 4017C-R Compact Shotgun Microphone with MMP-C Preamp and Rycote Windshield Kit from DPA Microphones is for capturing audio. It is used in various audio for video applications such as wedding videography, film, broadcast TV, and more. This kit provides everything a boomer, outside broadcaster, journalist or location film maker could need for clear, directional sound capture. 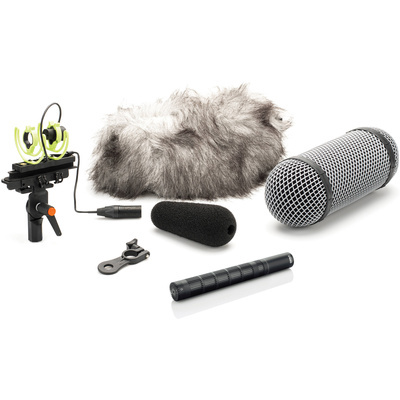 Featuring a DPA 4017C shotgun microphone pre-mounted in a Rycote suspension, with windshield, fur windjammer, XLR holder, brush, DPA XLR cable, and foam windscreen, this kit can provide maximum isolation in windy and wet weather conditions. The 4017C-R features a supercardioid lobe-shaped directional pattern and is a pre-polarized condenser microphone. It has a frequency response of 20 Hz to 20 kHz and is powered by 48V phantom power. It is featured with the compact MMP-C pre-amp so booming applications such as in a car or in low ceiling rooms is uncomplicated. The total length of the microphone is 6.1" and it weighs only 2.5oz making it great for camera videographers. The 4017C microphone is built with an XLRM output connector. Windshield, suspension, fur windjammer, XLR holder, brush, XLR cable, and foam windscreen are included.